The Logan Utah Temple is the 2nd operating temple of The Church of Jesus Christ of Latter-day Saints. On May 17, 1877 the building of the Logan Utah Temple was announced and the day before the site had been dedicated. Construction began soon thereafter. The site of the Logan Temple had been held in reserve for many years. It was used as a park and public grounds before being dedicated as the site for the temple. A call was sent out for workers. Brigham Young asked that all of the people that worked on the temple volunteer their time or other aid. He encouraged the saints to have the temple done in three and a half years. Roughly, 25,000 people worked on the temple. Rocks were hauled from Logan Canyon, mostly during winter because it was easier to haul the rocks by sleigh than on a wagon. As completion of the temple neared women in the area were asked to make carpet for the temple, because commercially made carpet could not be bought in Utah at that time. The women spent two months working to hand make two thousand square yards of carpet. 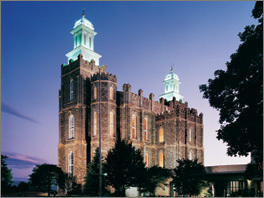 The Logan Temple was only the second temple to be completed in the Utah area. Its design, made by the Church’s head architect Truman O. Angell, had two towers and was based on the Salt Lake Temple, with a large assembly hall and other similar rooms. On May 17, 1884 the Logan Temple was dedicated. Unfortunately, not many years later in 1917 a fire destroyed much of the southeast stairway of the temple. Forty thousand dollars was spent to repair it in three months. In 1949 the temple was remodeled and received updated lighting, heat, air conditioning, elevators, and other modern conveniences. In 1977 another remodeling began. The interior was completely gutted and redone. President Spencer W. Kimball said that although the remodeling was necessary he regretted the loss of the original interior. After remodeling, the temple was rededicated on March 13, 1979 by Spencer W. Kimball. The Logan Utah Temple has a total of 119,619 square feet, four ordinance rooms, and eleven sealing rooms. This page was last edited on 24 January 2012, at 11:16.